A banjo ukulele owned by popular 1930s and 40s entertainer George Formby is to be auctioned, with an estimated sale price of £30,000. Hansons Auctioneers said the Gibson UB3 banjolele is expected to attract worldwide interest at the sale on 30 June, in Etwall, Derbyshire. 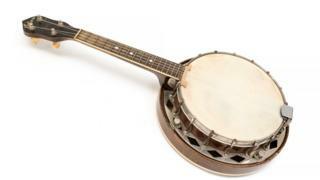 In 2008, another George Formby banjo ukulele sold for for £72,000 at auction to Queen's Brian May. In 1936, the BBC banned Formby's song The Window Cleaner for being smutty. John Croft, former president of the George Formby Society and ukulele expert, said: "There is huge interest in this instrument. George Formby has fans all over the world - young and old." Mr Croft, from Llanyblodwel, Shropshire, added it was a "wonderful piece of social history". "In his heyday in the late 1930s, George Formby earned more than three top Hollywood stars put together - Errol Flynn, Douglas Fairbanks and Clark Gable. 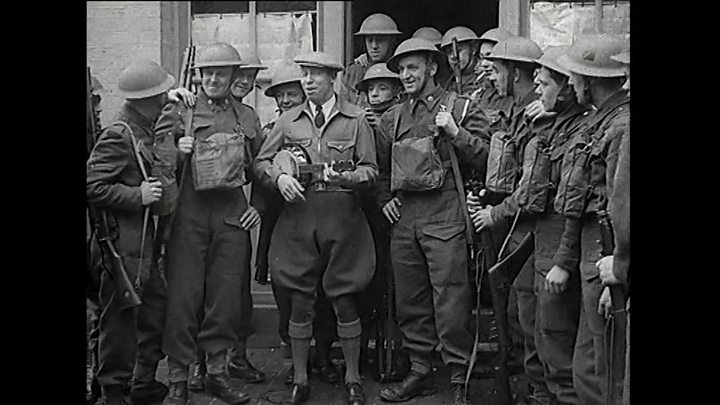 "And we should never forget Formby's contribution to boosting morale among the troops during World War Two. "He and his wife Beryl flew out to dangerous war zones, including El Alamein. This country owes a great deal to them both. "I hope the instrument stays in the UK but the most important thing is that it is loved and played." This banjolele was originally purchased by Bill Logan, the first president of the George Formby Society. Charles Hanson, owner of Hansons Auctioneers, said: "This is such a rare opportunity. This was one of George Formby's favourite banjoleles and the chance to own and play it is very special. This instrument is a priceless treasure for Formby fans." Formby was said to have owned three Gibson UB3 models.